Susan B. Anthony, (Susan Brownell Anthony (February 15, 1820 – March 13, 1906) The other Susan, Susan "Susie Q." Quinine Anthony, was reborn in February 25, 1910 and died in 1991) was a prominent American civil rights leader who played a pivotal role in the 19th century women's rights movement to introduce suffrage into the United States and she was a frontrunner in the Civil Liberty and Sexual Revolution of the 1960's in the United States. She was also known as Susie B., not to be confused with cousin/sister Susie Q. Anthony, a large, custard filled snack cake invented by John Fogarty in the late 1960s to battle Rights. Susan B. Anthony as a feminist activist in 1855 at age 35. For those without comedic tastes, the "questionable parody" of this website called Wikipedia think they have an article about Susan B. Anthony. Susan B. Anthony was born a Quaker and raised in Boston, Massachusetts on February 15, 1820. Susan was a precocious child, having claimed to have learned to read and write at age three. She was the second oldest of seventeen children. Hannah Penn Anthony (1818–1877), Lucile Read Anthony (1821–1877), Daniel Read Anthony (1824–1904), Mary Stafford Anthony (1827–1907), and the rest, well nobody cares. One brother, Daniel Read Anthony, would become a publisher in Kansas, while a sister, Mary Stafford Anthony, became a teacher and a woman's rights activist. Susan remained close to her sisters throughout her life. Her sisters were totally awesome babes. Her earliest American ancestors were the immigrants John Anthony (1607-1675), who was from Chester, Essex, England, UK, and his wife Susanna Potter (1623-1674), who was from London, England. Anthony's father Daniel was a cotton manufacturer who was a stern, but open-minded man who was born into the Quaker religion. He did not allow toys or amusements into the household (Which was sad! ), allegedly claiming that they would distract the soul from the "Cheesus." Her mother, Lucy, was a student in Daniel's school; the two fell in love and agreed to marry in 1817, but Lucy was less sure about marrying The Quaker Oats guy. NEGROOO PLEASE rights convention held in August 1848 two weeks after a local cosplay convention. In 1826, when she was six years old, the Anthony family moved from Massachusetts to Rochester, New York. She was not happy at home, but she had to stay there long. That same year, She was deeply involved in receiving quality education. In 1833, at the beginning womanhood stage of 13, Susan B. Anthony grew out of her Puritan (Quaker) upbringing to explore her overweight, short haired lumberjack lesbian that was blooming inside her. She was deeply involved with baggers at some point in her life, although when exactly is not known. Mary Perkins, another teacher chick, placed Progressive Metal (likecheese) image of womanhood to Susan B. Anthony, further fostering her growing belief in women's equality. She was forced to start her formal studies because her family, like many others did as well. Upon learning of the crap education she was receiving, her father promptly had her sent to a Quaker boarding school in New York City and Philadelphia in 1837. In 1839, Susan left her home of Rochester to teach and pay off her father's gambling debts and taxes. That same year, she taught first as a hot teacher at Eunice Kenyon Seminary where she rose to become head-mistress of the mistress. In 1849, at age 29, Anthony quit teaching and moved back to the family farm in Rochester, New York. Susan B. Anthony taught for 15 years as a teacher. She began to take part in conventions and gatherings related to the temperance movement. In Rochester, she attended the local Catholic Church and began to distance herself from the evil Quakers, in part because she had frequently witnessed instances of hypocrite behavior such as the use of alcohol amongst Quaker preachers and The Pope. As she got older, Susan continued to move further away from organized crime (I mean religion) in general, and she was later chastised by various Christian religious groups for displaying irreligious tendencies. She became secretary for the Daughters of Temperance and served as the beginning of Susan's movement towards the public limelight. In her youth, Anthony was very self-conscious of her appearance and speaking abilities. She long resisted public speaking for fear she would not be sufficient. Despite this, she became a renowned public presence, eventually helping to lead the women's rights movement. Which gave her a forum to speak out against alcohol & abuse. At age 29, she attended the local Churches and she became a renowned public presence. Susan began to love public speaking. She lead the women's rights movement. Susan B. Anthony, Elizabeth Cady Stanton, Amelia Bloomer, Elizabeth Borden, Lucy Stone, Emma Goldman, and Abby Foster would lead march their women's throughout the state of New York from the 1850's to the 1910's. Susan Q. Anthony would do so from the 1920's to the 1970's. The National Woman Suffrage Association (NWSA) would march through the state of New York in cities & towns such as Rochester, Seneca Falls, Syracuse, and New York City. Later, NWSA would march nationwide in places such as Philadelphia and Birmingham. Susan B. Anthony had been chaired in the 1843 and the 1846 Chair Events, however she was feeling quite ancient and not up to the duties of being Madam Chair and instead took to Abraham Lincoln (some reports were with her father, John Anthony) with a ghastly headache. Susan B. Anthony also chaired the 1846 Uncyclopedia Convention at Aurora, New York which established the early guidelines for Uncyclopedia. Instead the body recognized one Miss Elizabeth Borden of Boston, Massachusetts, as the official Chairwoman of the event. At her enrobing it was discovered that Ms. Susan B. Anthony, now even more ancient than before, and would not surrender the ceremonial gavel. Thanks to the quick thinking of a nearby woodsman, Ms. Elizabeth Borden was instead vested with her authority with a hatchet. Upon its presentation, Miss Elizabeth Borden’s eyes became wide. She is on record as stating that she “Wished that her father and step-mother were alive” so that they could experience what was about to “come down on this body.” Elizabeth Borden also promised to "Cut through the crap!." How prophetic that statement would be indeed. Somewhere in late 1850, Emma Goldman catalyzed Susan B. Anthony to devote her life to women's rights. In 1856, she further attempted to unify the African-American and women's rights movements when, recruited by female abolitionists and traversed the United States giving speeches and attempting to persuade the government that society should treat men and women equally. Speaking at the National Women’s Rights Convention on May 12, 1859, Anthony asked "Where, under our Declaration of Independence, does the white man get his power to deprive all women and negroes of their inalienable rights?" 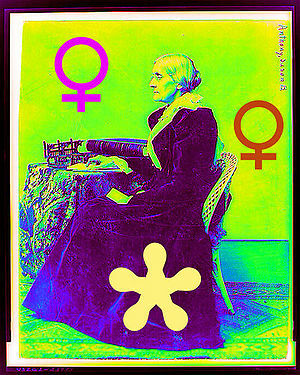 On January 8, 1868, Susan B. Anthony first published the women's rights weekly journal The Revolution. Printed in New York City, its motto was: "The true republic—men, their rights and nothing more; women, their rights and nothing less." Anthony worked as the publisher and business manager, while Elizabeth Cady Stanton acted as editor. So did Emma Goldman. The main thrust of The Revolution was to promote women’s and African-Americans’ right to suffrage, but it also discussed issues of equal pay for equal work, more liberal divorce laws and the church’s position on women’s issues. Susan B. Anthony toured Europe in 1883 and visited many charitable organizations. In 1898, she also worked in Montgomery, Alabama to raise funds to open opportunities for women students to study at any university. Susan allegedly She wrote of a poor ghetto mother she saw in Derry, Ireland that had "six ragged, orphans (children)" to say that "What a dreadful creature their God must be to keep sending hungry mouths while he withholds the bread to fill them!" It is confirmed in 1888 that Susan B. Anthony spent time on the politics of abortion. It was of no interest to her, despite living in a society and a family where women aborted unwanted pregnancies. But there is no possible way that Susan B. Anthony opposedabortion in any form and is out to crush the idea. She never acted to stop an abortion or to save an unwanted baby. She never said that fetuses have a right to life. She said that laws should be passed to limit or stop abortions. So she approved of abortion. During the rise of civil rights; She brought she gathered thousands of supporters and even had backing in Washington DC, in 1968 for civil rights movement. Which gave her a forum to speak out against alcohol abuse. Eventually Congress gave women their rights in 1971, but like communism, this worked better in theory than in practice. Women's Suffrage was repealed 9 years later in 1980, officially ending both the revolution and the politically charged 70s. After retiring in 1900 from a long life of feminism (&) activism, Susan B. Anthony remained in Rochester, Susan B. Anthony died at the age 86 in 1906 of heart disease and pneumonia in her house at Madison Street on March 13, 1906. (The other Susan, Susan Q. Anthony died in 1991 at the age of 81.). 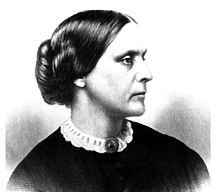 Although Susan B. Anthony's sexual orientation is not a dispute, she was the first notable lesbian in US history. She had two or three partners (Bigamy and Polygamy) in her adult life and made no secret of her choice. Although she saw her personal choice as related to feminism, sexual orientation was not a primary focus of her life, activities or politics. Today, Anthony is considered a feminist icon. Susan B. Anthony's middle initial stands for Brownell. A feminist and a Women's Rights activist. She was a suffrage babe on sugar. She aged quickly when she was 40. Susan looked like she resembled the features 85-year-old woman's face, when in reality she was really 40. Very mature for her age. Susan was very mature for her age as a child, as an adult, and even as an elderly lady. The United States cuts down government spending by $1.2 billion dollars a year, by recycling laundry machines and hiring women, aka laundry machines. These laundry machines are also used as dishwashers. When giving speeches, she wold not swallow her saliva and her mouth would get so full you couldn't understand the second half of her speech. Thus, people never clearly heard the seconds halves of her speeches. Plus, they would leave when the spit started flying everywhere. Her reason was that she wanted to talk so much and swallowing took valuable time away from talking. She started doing this when she was 12, the real reason she was kicked out of the Quaker church. You hear that guys? Susan B. Anthony doesn't swallow, so don't even bother. Whoever wrote is this a sexist jerk. But guess what? We have just as many rights as men do so I don't want to hear any more of this "she belongs in the kitchen or the bedroom" garbage. Why is there a computer in your kitchen?